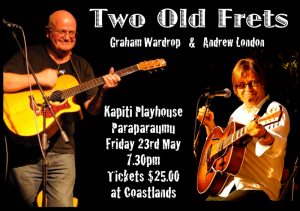 Andrew London and Graham Wardrop at Kapiti Playhouse - Kapiti Playhouse Inc.
Andrew London and Graham Wardrop come together for the night in a concert to be held at Kapiti Playhouse Theatre at 7.30pm on Friday 23rd May. Tickets are available for just $25 from Coastlands Information Desk (phone 04 902 9885). Door sales may be available but if you don’t want to risk missing out, buy your tickets ahead of time! Andrew London will be well known to many members, having performed a number of times at the Playhouse. Graham Wardrop is one of New Zealand’s best acoustic guitarists and singer/songwriters. He also builds his own guitars. Graham has been acclaimed as one of New Zealand’s finest finger style guitarists. After thirty years in the professional arena, he is regularly called upon to give concert performances, to play on television and studio recording sessions, to hold workshops in advanced finger style techniques for steel string guitar, along with providing atmospheric music in sophisticated dining situations. He has toured, opened shows and/or worked with Tommy Emmanuel, Valdy, Martin Taylor, Leo Kottke, Suzanne Lynch, Anne Kirkpatrick , Michael Fix, Manhattan Transfer, Gerry and the Pacemakers, Vanessa-Mae, Michael Crawford, Jasper Carrot, Billy T. James, Slim Dusty, Gray Bartlett. Not only does Graham maintain a busy performance schedule, but he also handcrafts instruments on which he performs. He is a musician of great versatility and his love of balance, harmony and precision culminates in his richness of sound and a unique style of performance.